Hybrid vehicles are growing in popularity, with 4,500,000 sold worldwide in 2012, almost half (2,180,000) in the United States. Hybrid vehicles alternate between gasoline and electric power sources, reducing harmful green house gas emissions and saving the driver money on fuel. One oft-cited disadvantage to owning a hybrid car is the high cost of batteries for hybrid cars. Studies have shown that the lifespan of a hybrid battery can be as low as six years, even though most come with an eight year, 100,000 mile warranty. The average cost to replace a hybrid battery can be anywhere from $1,000 to $6,000, depending on the model and year of the car. Some car owners may want to replace the car before the battery ever needs to be replaced, but they are only a small percentage of hybrid car owners. One of the easiest ways to save money on your hybrid car battery and to help the environment at the same time is to purchase remanufactured hybrid batteries to replace the one that’s dying. Remanufactured hybrid batteries simply have all the dead or used battery cells replaced with shiny new ones. This way, you can keep driving your hybrid car for years to come, while saving thousands of dollars on a new battery. While even remanufactured hybrid batteries can be costly, many hybrid owners are comforted by the fact that they are saving a comparable amount of money with their car’s improved fuel economy. The 15-year-old Honda Insight is the most fuel-efficient vehicle ever rated by the Environmental Protection Agency (EPA), reaching 61 miles per gallon on the highway, and with a combined city/highway rating of 53 miles per gallon. 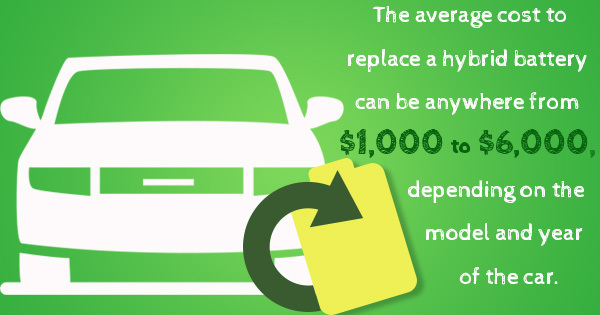 Any money the car owner spends on a new battery is money they have saved over the years by buying less gasoline.